If you’re planning on drinking more than ten grams [of alcohol] a day (1.25 units) you’re increasing your risk of dementia. If, for example, last week you were drinking on average ten grams of alcohol a day, about a bottle of prosecco that week, but then next week you increase that to two bottles of prosecco, you’re putting yourself at significant risk. Prosecco? Prosecco! One sip of that sugary girly-filth poses an appreciable risk to health which has nothing to do with alcohol. If you are going to bathe your troubled brain in Morpheus' balm, do it with something decent. Tonight, for example, will be a bottle of Merlot (or two) followed by a few palate-cleansers (pink gin). Fasten the corkscrew to your belt with a string. That way you will never need to remember where you put it and so dementia will never be a problem. Wherever you wander off to, you will always have your life support system with you. If you haven't got your trousers on you probably shouldn't be drinking anyway. Wise words from Figures of Speech as ever. Chin, chin! All the intelligence reports flowing into the Figures of Speech bunker confirm that Germany is now defenceless. Indeed, all the relevant positions in the German government have confirmed this. All defence infrastructure is inoperable; most of the armed forces are in distant lands training policemen; the few remaining in Germany are either drunk, stoned or members of military bands. What are the Austrians waiting for? This is their chance to right the many wrongs they have suffered at the hands of the Prussians since 1740. Hungary, Poland and the Czech Republic would join Austria without hesitation. A few tanks around the Bundestag and the job's done. Europe would once more have its dominant, Catholic, conservative empire to resist the Turks and whatever other invaders may turn up. I haven't had feelings like this since I last dined in the officers' mess in Vienna under the portrait of President Kurt Waldheim. Go, plucky Austria, the double-headed eagle awakes, straining to swoop on the fat German hen! This one's for the Anschluss! Austria, your moment has come! Yesterday, Friday 16 February, Angela Merkel and Theresa May gave a joint press conference in Berlin on the subject of Brexit. The event was scarcely reported in the German media: why would anyone in Germany be interested in Theresa May: an irrelevance who never says anything at all worthy of note. The British media showed more interest, desperate to try to deduce from some form of words or some expression anything at all that may be going on in the Brexit negotiations. From May, as usual, there was nothing but anodyne greyness and multiple announcements that she was about to give a speech / have another meeting / sit down and discuss everything together, all delivered in that tense, wavering, earnest tone that overcomes her when she is nervous. Merkel, on the other hand, despite all her current domestic trials with coalition forming, was calm and down-to-earth, with a hint of 'do I really have to say all this again' boredom. In that press conference she appeared much more credible than May. Desperate to find something worthy of reporting, the Brexiteer section of the media chose to use a blatant mistranslation to inject at least a bit of drama in all the greyness. Merkel had said, they reported in one way or another, that she 'deplored Brexit'. Hillary Clinton's unwise condemnation of Trump supporters as a 'basket of deplorables' is still echoing and has turned the word 'deplorable' into a dog-whistle word for many on the right-wing. Yesterday the whistle was blown on Angela Merkel. Wir haben unsere Positionen zum Austritt Großbritanniens im Grundsatz natürlich nicht verändert. Wir bedauern das. Aber wir wollen die Verhandlungen so führen, dass wir auch nach dem Austritt Großbritanniens eine möglichst konstruktive und enge Partnerschaft haben werden, sowohl wirtschaftlich als auch politisch. Pressekonferenz von Bundeskanzlerin Merkel und der britischen Premierministerin Theresa May im Bundeskanzleramt, Freitag, 16. Februar 2018, Mitschrift Pressekonferenz. We have not changed our basic positions on the departure of Great Britain of course. We regret it. But we want to conduct the negotiations in such a way that even after the departure of Great Britain we will have as constructive and close a partnership both in economic and political terms. Bedauern does not mean 'deplore' in English. It means 'to regret', 'to be sorry about something' and so on. It contains no trace of the condemnation of 'deplore', which is much closer to the German word verachten. The bad translation and its gleeful adoption by the Brexiteer media in the service of a headline is deplorable, not regrettable. German Grand Coalitions are not what they used to be. The term was coined for the coalition of the Union (CDU/CSU)[~right-wing] with the SPD[~left-wing] in the fifth Federal Parliament (1965-1969). Then, the Union had 251 seats, the SPD had 217, a total of 468 out of 518 seats, that is 90% of all seats. The third party, the FDP[~fiscal conservatives] was left out in the cold with 50 seats. In today's 'Grand' Coalition the Union has 246 seats and the SPD 153, making a total of 399 seats out of 709, that is 56% of all seats. The remainder is scattered among several smaller parties, of which the two largest are the AfD (94) and the FDP (80). The presence in parliament of the two parties of left-wing lunatics, the Linke (69) [ex DDR] and the Greens (67) means that the new government can wander as leftward as the SPD wishes to take it, but in fact – do we need to repeat ourselves? – nothing will change. The big, grotesquely fat, spatchcocked eagle that has presided over the parliamentary chamber in various incarnations since 1953 is the true metaphor for German politics: ponderous, unthreatening, slightly ridiculous, certainly when compared with the lean, mean, killing-machine that was the Reichsadler. This is not a Grand Coalition. It is a Desperation Coalition. The parameters of the GroKo, the Grand Coalition in Germany have been agreed by the CDU/CSU and the SPD. The agreement will formally take effect once the SPD party has voted to accept it. There is little doubt that this will be so, particularly since the Young Socialists – the main opponents to the new coalition in the SPD – have been promised an increase in BAFöG payments (study grants) and a minimum wage for apprentices. The left-wingers of the SPD have also been promised that for every Euro that is spent on defence, a Euro will be spent on development aid. Let's see what President Trump thinks of that idea in NATO. The government has also agreed to put more money into the EU. Given that Britain's payments will cease at some time in the future, this is probably more a necessity than a free choice. For the citizen the new government could be one of the most expensive of all time. The spending wishes of the socialist politicians dominate, economic rationality has been thrown under the wheels. In earlier times the areas of financial and economic politics were part of the core of the CDU/CSU union - now, no longer. The CDU was had over by a 20-percent party. All the central ministries have gone to the SPD or the CSU. Is that the price that has to be paid so that Angela Merkel can remain as Federal Chancellor? Für die Bürger dürfte die neue Regierung eine der teuersten aller Zeiten werden. Die Ausgabewünsche der Sozialpolitiker dominieren, die haushaltspolitische Vernunft kam unter die Räder. Früher gehörten Finanz- und Wirtschaftspolitik zum Markenkern der Union, heute nicht mehr. Die CDU wurde von einer 20-Prozent-Partei über den Tisch gezogen. Alle zentralen Ressorts gehen an die SPD oder die CSU. Ist das der Preis dafür, dass Angela Merkel Bundeskanzlerin bleibt? The show goes on. Nothing has changed, whatever the FAZ may say – in Germany things have been proceeding in the same direction for the last 20 years at least. It seems that an illegal immigrant was found hiding in a cave in the Cheddar Gorge 10,000 years ago. He appears to have been sent back to his ancestral hunting grounds in short order. 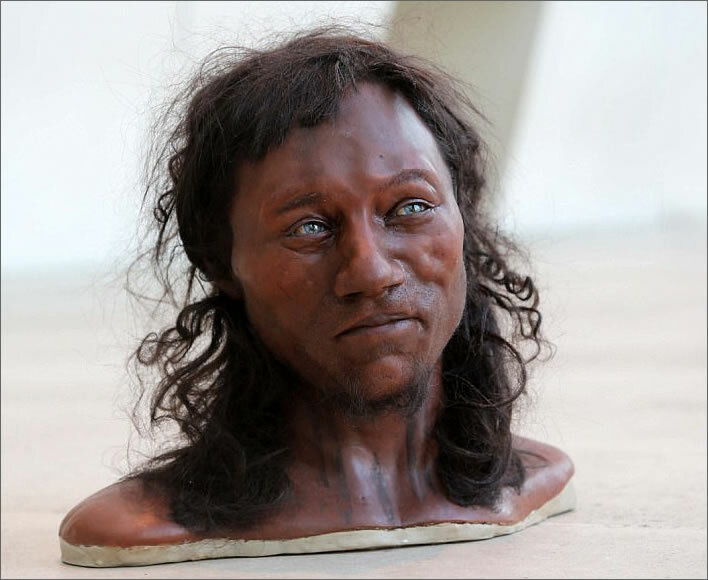 We are also told that there is a 76 percent chance that his skin colour was 'dark to black', which seems to justify colouring the model of his head dark brown. (Another colour name springs to mind, which is presumably why the Daily Mail chose to moderate its readers' comments on this article, but let's move on). We are also told that 10 percent of white Britons are descended from the immigrant's ancestors, which might suggest, all other things being equal, that he may have belonged to the 24 percent white possibility. 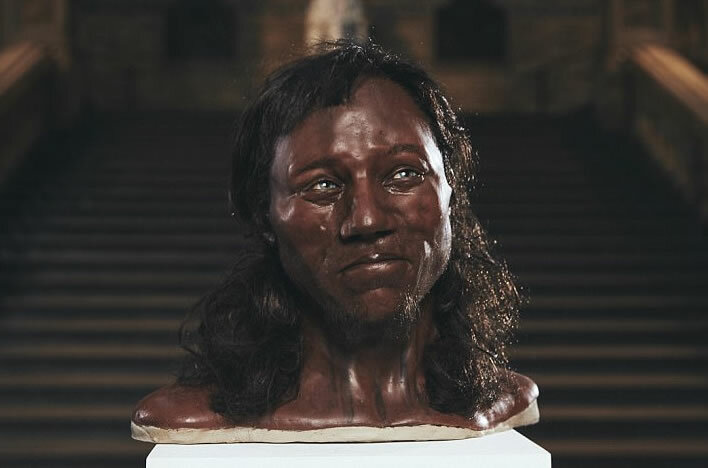 For me, it's not just the skin colour that's interesting, it's that combination of features that make him look not like anyone that you'd see today. Not just dark skin and blue eyes, because you can get that combination, but also the face shape. So all of this combines together and make him just not the same as people you see around today. At the moment I’d suggest this is a good model for what the rest of Britain looked like. So bang goes our immigrant theory. All we have to explain now is the Darwinian evolution of the black people of Britain 10,000 years ago into a nation of white people. That will set the cat among the pigeons. 10,000 years hence, the next Professor Barnes will be surprised to find the remains of a white person.